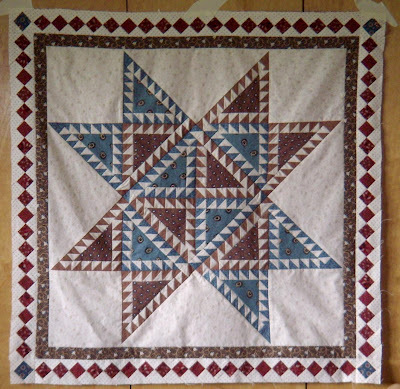 Quilts and Pieces: Finally a bit of quilt stuff! Finally a bit of quilt stuff! Our guild had their quilt show this weekend. 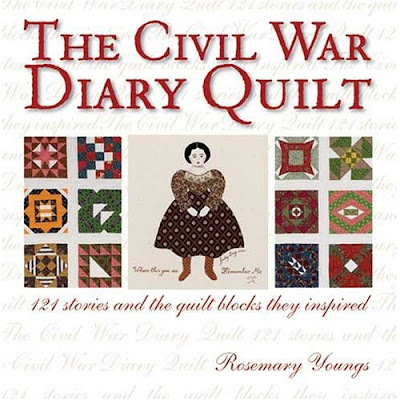 I finally have some quilty things to share with you. Today is a peek at the 2 ribbons I got! I was so surprised when I walked in yesterday! Our show is judged by a NQA judge so that made it even more exciting. My Brownstone quilt won "Best of Show"! How cool is that! And I also got 1st place in the Miniature category for my Cheddar Squares (Lori's Cheddar Cheese and Crackers quilt). Tomorrow I"ll have more pics from the show. Congrats to you! Isn't it a wonderful feeling when someone recognizes the good work you do. Congratulations! Your ribbons are well-deserved. I'm happy to see that traditional quilts are still being acknowledged by judges - as they should be!! Well, look at you!! Bringing home big awards and everything. Very exciting! Both quilts are lovely! My kind of colors and scrappiness. I couldn't enlarge the photos on this post. Tell me about the quilting on your two pieces if you have time. Congratulations on the ribbons. Best of Show is very impressive. Both quilts are very pretty. well deserved Best of Show! oh and Lori's cheddar and crackers YEAH! 1st place way to go! Gorgeous! I took a little break to catch up on the blogs today and now I am totally inspired to get some quilting done. I love them all! Congratulations on your ribbons! Well deserved awards! Reminds me that I have a Brownstone ready for borders, hiding somewhere in my house. You were the lady who got me started on it. 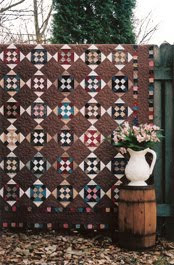 It's such a great quilt with an organized scrappy look. I'm sure Lori will enjoy reading about the blue added to her cheddar and crackers design. Congratulations! How fun for you. Awesome! Both ribbons very well deserved! The brown quilt sings to me. Congrats on your two fabulous ribbons! Of course, they are well deserved! Your quilts are beautiful! Woohoo! Congratulations. They are both beautiful! Congratulations on those two beautiful quilts! That must be such a nice feeling! Best of show!! Congratulations, what exciting wins. I love them both as much as the judges. Congratualtions - very exciting and well deserved ribbons!! Congratulations - it's especially nice to see "traditional" getting first appreciation. 8-)) It's a beauty! Congrats! Your brownstone quilt is lovely! Fabuloso! I am so exited for you! Great job! Love those quilts! Congratulations!! how wonderful and well deserved. Lori will be excited to see that too. The small quilt found its new home!